This is a great deal for a high quality battery charger that comes with 4 free NiMH AA batteries. This battery charger is the perfect for anyone that uses a lot of batteries in their electronic devices. This rapid battery charger is also a smart charger since it accurately controls charging time and depth. 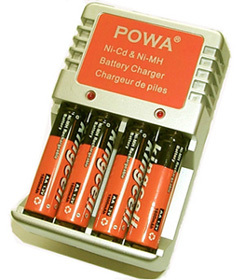 The discharge/recharge cycle will prolong the life of your NiMH and Nicad batteries. This battery charger can charge AA, AAA, and 9-volt rechargeable batteries. Free - (4) high quality rechargeable AA batteries. These 1800 mA NiMH batteries are a big help to anyone that uses high drain electronics such as digital cameras and video games.